The sophisticated exterior styling of the 2019 Chevrolet Suburban features perfectly placed chrome trim and strong yet subtle body lines for an overall athletic appeal. On the interior the 2019 Chevy Suburban offers flexible seating that provides versatile cargo and passenger space that instantly improves your daily commute as well as weekend excursions. The 2019 Chevrolet Suburban is offered in three trim levels so it is easy for SUV shoppers to find the specs and features that they are after without blowing their budget. 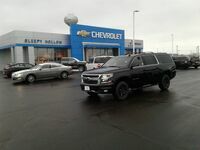 You can learn all about the standard and available specs and features of the three trim levels of the 2019 Chevy Suburban below and you can get behind the wheel of the 2019 Suburban today at Sleepy Hollow Auto proudly serving the La Crosse, WI community since 1989. The three trim levels of the 2019 Chevrolet Suburban are the LS, LT, and Premier. All three trim levels get equipped with a standard 5.3L Ecotec®3 V8 engine that supplies the 2019 Suburban with 355, horsepower, 383 lb-ft of torque, and a 6,300-pound max towing capacity. The Suburban Premier trim level has the option of being equipped with a 6.2L Ecotec®3 V8 engine that increases performance specs to 420 horsepower, 460 lb-ft of torque, and a 7,300-pound max tow rating. Both engines work with an Automatic Transmission for optimal fuel economy. There is standard seating for eight people and the Premier trim level has seating for seven because of its second-row bucket seats and the 2019 Chevy Suburban provides them with 122.4 cubic feet of overall passenger volume. Both rear rows of seats have fold-down functionality for cargo and passenger space flexibility and the standard cargo area of the 2019 Suburban measures 39.3 cubic feet and with the rears seats folded flat the Suburban has 121.7 cubic feet of cargo space. Standard interior features of the 2019 Chevrolet Suburban include an 8” Color Touchscreen Display, Bluetooth®, Apple CarPlay™, Android Auto™, a 6-Speaker Stereo, a Remote Starter, and a 4G LTE Wi-Fi® Hotspot. 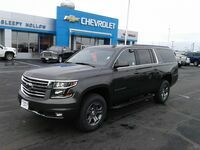 Upgrade all the way to the 2019 Chevy Suburban Premier trim level and owners are rewarded with a GPS Navigation System that can map in 3D, a 10-Speaker Bose® Centerpoint® Surround Sound System, Leather-Appointed Seats, Heated & Ventilated Front Seats, Heated 2nd-Row Seats, a Leather-Wrapped & Heated Steering Wheel, and Wireless Charging Capability. You can take the 2019 Chevy Suburban for a test drive today at Sleepy Hollow to experience all of its exciting equipment firsthand.